win. prizes for raising pledges for this inspiring, successful youth empowerment program! The top #Modo8k fundraiser will receive a free 1-year Modo Membership and $200 Running Room gift certificate! And weekly winners receive $50 Running Room gift certificates! Not running? Make a pledge in Team Modo's name and/or join us race day as a volunteer! (Email tommy@modo.coop for more details about volunteering). is that a new fuel card in your pocket? Yes, it is! Over the next few weeks, we'll be replacing the fuel cards in our vehicles with new orange and white cards. The new fuel cards are a more secure and reliable product. (We know, we know, they say "corporate," but don't worry, we're still 100% co-operative). Please note: These cards only work at the pump; should you be declined during a transaction, contact Modo at 604.685.1393 and we'll do our best to help. Pro Tip: You don't need to ask for a receipt! We have all the information we need through the card's transaction, so save some paper and keep our vehicles clutter-free by pressing "No." Pictured: Fleet Director, Doug; photo-bomb by Member Care co-ordinator, Michael. Every day, we're reminded how fantastic our membership is through Facebook posts, tweets, emails and phone calls. Hearing your stories of satisfaction are what keeps us striving to better our service for you, but when you go the extra mile to vote for us in an award category? That truly warms our hearts! 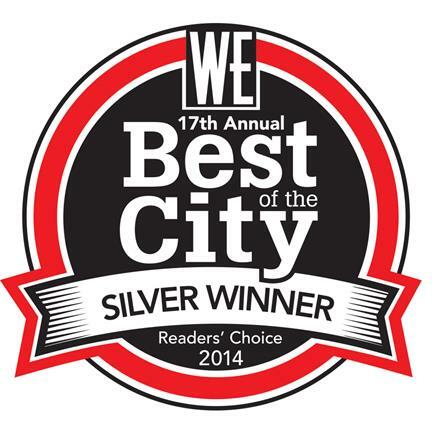 Thank you everyone who voted Modo Best of the City Silver in WE Vancouver's annual Best Of 2014 poll, and in the Vancouver Courier's Stars of Vancouver 2014 (look for it in Friday's issue)! You're all #1 to Modo! Run your heart out for a healthy body, healthy community, healthy city and healthy planet at the Modo Spring Run-Off 8k on March 23! 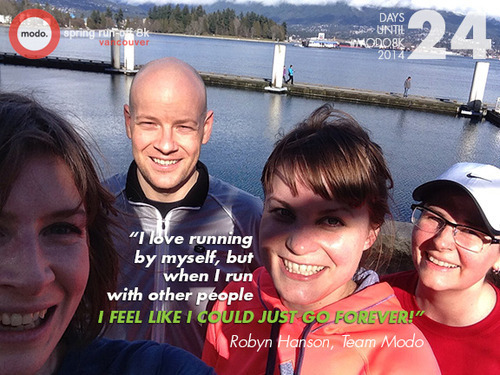 When you register to run, enter the promo code MODOMEMBER (case sensitive) to receive $10 off! Valid for Modo members only! 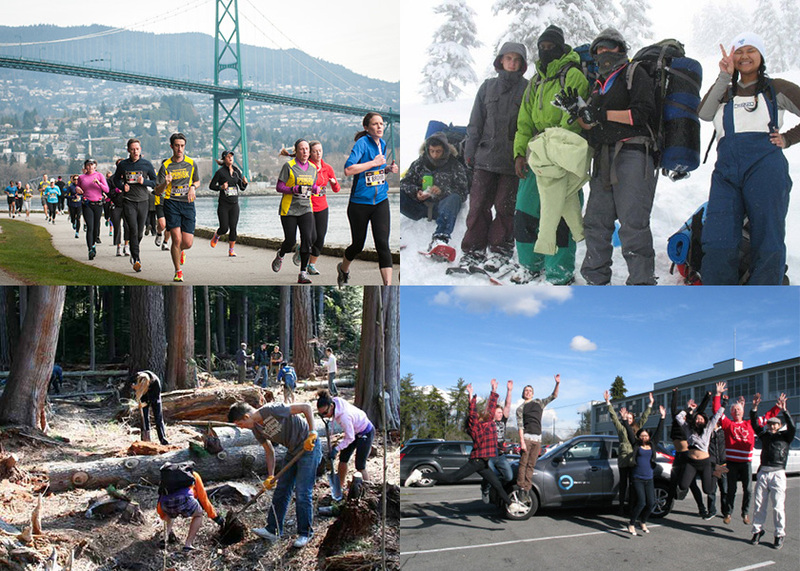 Top fund raisers will win prizes from Modo and the Running Room for raising pledges for Modo charity partner, Take a Hike! All funds raised through the #Modo8k go directly to Take a Hike. Join us for an easy 4–5k run around the Seawall every Wednesday at 12:15pm. Meet up with other Team Modo members outside the office at 470 Granville Street (between Pender and Hastings, just off the Skytrain). All skill levels welcome. RSVP on the Modo 8k Facebook group page or email teammodo@modo.coop. Follow #Modo8k on Twitter and Facebook for updates. >> COAST CAR CO-OP launches the Sunshine Coast's first carshare March 1, which means members can access vehicles on both sides of Howe Sound! >> SHARE A MEAL, HELP A CHARITY. On April 5, Modo joins hobby chefs, community partners and local businesses to team up again in support of local charities through #dinnerpartyYVR. Apply to be a hobby chef! >> TRAVELSMART Have you taken the TravelSmart pledge? Get free carsharing credits when you do! >> AND THE WINNER IS... See who took home the top prizes in HUB's first annual Bike Friendly Business Awards on Feb 5. >> NEW LOCATIONS in Vancouver's Collingwood neighbourhood and Surrey's city centre, with more on the horizon very soon. Visit modocoop.tumblr.com for more blog updates! Add our community calendar to your iCal or Google Calendar! The DOXA Documentary Film Festival is coming up in May, and you can help raise funds to make it the best festival yet just by... shopping! Bid on an amazing array of online auction items, from tickets to hear Astronaut Chris Hadfield speak to 1 tune-up at Our Community Bikes. Full item list here. Want to hear current dialogue on environmental issues impacting our region? Carbon Talks hosts "Small Steps in Ecological Footprinting", with panelists Jennie Moore and James Boothroyd on understanding our ecological footprint. Limited seating still available. This Saturday, a Modo contingent will be heading to Gibsons to celebrate the launch of the first carshare co-op on the Sunshine Coast! Meet the team behind Coast Car Co-op, learn about its founding and celebrate with Community Partners, 11–2 pm at the Gibsons Public Market. RSVP on Eventbrite. It's time to begin thinking about your garden for this year! Seedy Saturday is the first event of the Kensington-Cedar Cottage Seed Sharing Library's 2014 season. Take home seeds for your garden, share ones you've saved and meet other garden lovers in the neighbourhood. Open to all ages from 10 am–12 pm. Have you thought about participating in Vancouver's Mini Maker Faire? Have questions and need advice? The Maker Town Hall is an evening of presentations, Q&As, and networking with fellow makers! This event is geared toward novice Mini Maker Fair participants with a veterans event planned for a future date. Pre-registration is recommended. ArtShift BC aims to bring together artists, activists and everyone in between to cultivate collaboration and learning. A full-day of hands-on workshops in art-based creative action tactics, organizing and more. Participation is open to all, entry is by donation. Held at the Croatian Cultural Centre, the 2014 Vancouver Diversity Health Fair brings together a wide variety of health and wellness exhibitors, assessments, performance and demonstrations presented in a number of languages. The Croatian Cultural Centre is located near the Commercial/Broadway SkyTrain Station at 3250 Commercial Drive. The Bicycle Valet will be on site. Our friends at LOCO BC throw fantastic monthly mixers on the first Tuesday of each month. They're a great opportunity to meet local business owners, enjoy local food and drink, and support a stronger local economy. This month, Commissary Connect is your host and they're home to such local favourites as The Juice Box, Meliferra Bees and Leaf It To Me. Tickets here. Western Canada's largest bike display and entertainment show is kicking off cycling season next month! Packed with events, manufacturer displays and opportunities to see what's new for cycling in 2014, this is a must for all bike enthusiasts. Tickets here. Following the success of the Fall Workshop Series, the Vancouver Tool Library has created four new workshops to pass on their knowledge and help folks hone some new skills. Want to build your own slingback chair or make your own cutting board? Sign up early because these tend to fill up fast! Dara Parker, Executive Director of Modo Community Parter, QMUNITY, joins a panel for CBC's Radio 1. Hosted by Stephen Quinn at the Fountainhead Pub on Davie Street, the event is open to the public. Yes, that Walrus. Part of their National Events series, "The Walrus Talks Energy" has assembled an esteemed panel to consider our sustainable energy future, the challenges of energy production, our collective impact and what lies ahead. Tickets here. Modo Community Partner, The Shooting Stars Foundation is bringing its Motown Meltdown showcase to the Commodore Ballroom on March 29! Hear some classic Motown hits performed by 25+ Canadian vocalists, backed by a scorching 12-piece band. If you can't make it downtown in March, Motown Meltdown Tri-Cities is drifting into Coquitlam on April 5. March 29 tickets here. While #dinnerpartyYVR takes place April 5, this is your friendly reminder (and encouragement) that Modo Community Partner Social Bites is still recruiting a few more hobby chefs for this event! If you have a special dish you'd love to share with some new friends, as well as raise money for a local charity, sign up online! Due to construction at the Lonsdale Safeway, we've moved our 2011 red Dodge Grand Caravan (#476) to Marlborough Tower at 144 West 14th Street, between Lonsdale and Chesterfield Avenues. This is a residential tower behind the library, directly across from City Hall. Our stall is on the upper level of the parkade; enter from behind the building, between 14th and 15th Street. A 2013 red Dodge Grand Caravan (#418) has replaced the 2008 Toyota Sienna. A 2009 white Toyota Yaris hatch (#273) will live here temporarily while waiting for its permanent home. A 2013 green Fiat 500c convertible (#512) lives here temporarily while waiting for its permanent home. A 2012 red Toyota Prius C (#475) lives here temporarily while waiting for its permanent home. A 2013 silver Fiat 500 (#510) has replaced the 2009 Toyota Yaris. A 2014 blue Nissan Versa Note (#519) has replaced the 2012 Nissan Versa. Find a 2013 red Dodge Grand Caravan (#509) in the Safeway parking lot at the corner of Kingsway & Tyne Street. Park in stall #13, next to our sign. Due to construction, we've lost our stall on Cambie Street and have moved our 2013 blue Dodge Avenger (#447) kitty-corner across Marine & Cambie. You'll find it in the 8100 block of Lord Street (one short block west of Cambie), just north of Southwest Marine Drive, in a designated stall on the east side of the street. A 2012 green Toyota Matrix (#409) has replaced the 2005 Toyota Corolla. ** Note: We've been doing a lot of car moves in the Edmonds area this winter as we try to position the fleet as conveniently as possible for as many members as possible. We're not quite finished, please look for a final configuration of cars by this time next month. Find a 2013 red Toyota Prius C (#454) and a 2013 grey Nissan Sentra (#513) in the parking lot at 10275 City Parkway, just east of the North Surrey Recreation Centre. Our stalls are very close to the north end of Surrey Central SkyTrain staion.